Honiara (Solomon Star): SOLOMON Islands is the first country in the Pacific region to operate an e-passport system, thanks to the Public, Private, Partnership (PPP) Model between the DCC Government and the IRIS Corporation Berhad Company of Malaysia. Prime Minister Manasseh Sogavare officially launched the e-passport system on Thursday, at the Honiara International Terminal. The successful launch of the system came about after the DCC Government signed an agreement with IRIS Corporation Berhad in November 2015. This is to help establish the information and management system of e-passport and boarder control in Solomon Islands. The Immigration Division of the Ministry of Commerce, Industry, Labour and Immigration was mandated under the agreement to implement the e-Passport and Border Control and Management System. The implementation of the project started early April 2016. 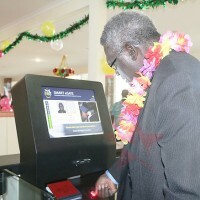 Prime Minister Sogavare was a happy man yesterday, when he proudly declared the e-passport system open. “….for Solomon Islands, this project is the first of its kind in the region and since it was also an additional policy initiative of the DCCG, the Government decided therefore to undertake the project under a Public/Private/Partnership (PPP) model, another first since launching of the PPP study Report,” Mr Sogavare said. He added that it is important also to recognize such engagement, between the government and private companies together with the e-Passport and Border Control and Management System. “From the government’s perspective, having the e-passport and Border Control and Management System in place will have enormous benefits for Solomon Islands Citizens and country,” the Prime Minister said. Mr Sogavare further highlighted that the IRIS Corporation Berhad was an easy choice to engage for the project as it is recognised for producing Asia’s first integrated smart card facility and for launching the first e-Passport in Malaysia in 1998. Speaking on behalf of the company, the Project Manager Sim Shin Yun said they are happy to work together with the National Government through the Immigration department to make this project a success. “As this is the first e-Passport system being set up in the Pacific, we are happy to contribute towards the history of this set up. “On behalf of the IRIS Corporation Berhad, I would like to thank the staff of the Immigration department for working closely with me and my team towards the success of this project,” Ms Sim said. Meanwhile, following the successful launching event yesterday, there are few works that needs to be done before it goes into full operation.